The Intel Pentium name has been around for quite a long time, it’s a name that used to be synonymous with the latest and greatest processor. These days though, the latest and greatest Intel processors are part of the Intel Core series. Today the Pentium processors are more on the lower end of the product stack, and cost relatively little by comparison. When it comes to the lower end Intel processors, I’ve had a question in my mind for some time now, and finally decided to satisfy my curiosity. How well will a low end processor run a gaming system these days? To answer this question I went to Newegg.com and ordered the Pentium G3220 for a whole $69.99, it wasn’t until I had the G3220 in my hand that I realized that I could save a couple of bucks by hitting Amazon.com and paying $67.63. 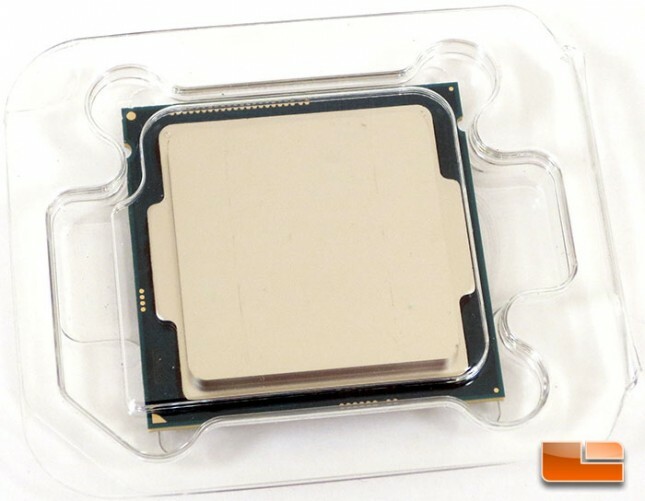 Where I ordered the Pentium G3220 from is a moot point, what does matter is that the G3220 is less than 22% of the cost of the Intel Core i7-4770K, the top LGA1150 processor! 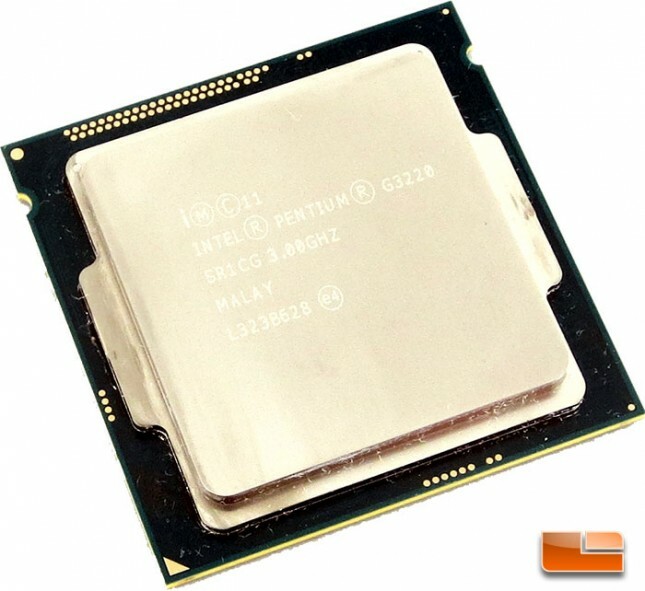 The Intel Pentium G3220 is a pretty basic processor by today’s standards. The G3220 doesn’t have all of the bells and whistles of the top tier processors, for under $70.00 you really can’t expect it to have everything under the sun. The Pentium G3220 is a dual core processor that cruises along at 3.0GHz and only fits in the latest Intel LGA 1150 socket. It’s not exactly a rocket ship, but at a minimum it will make your computer go. With a little bit of luck the Pentium G3220 will give us a great end user experience and we will be able to play all the latest games. The main thing we have to keep in mind while looking at the G3220 is that it’s not meant to be the fastest processor out there! It’s meant for those building on a budget. As you can see above, there are a number of differences between the Intel Pentium G3220 and the Core i7-4770K. Though as I mentioned above, for only 22% of the cost of the 4770K we can’t expect all the same bells and whistles between the two pieces of Silicon! 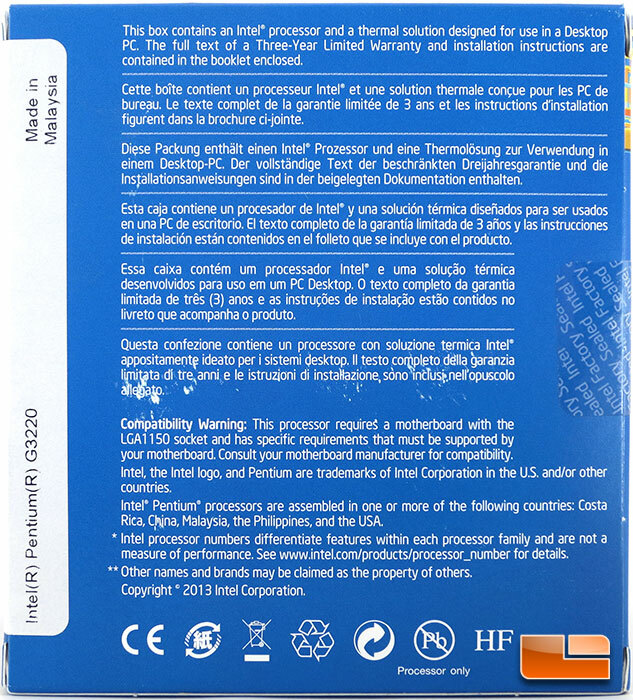 The retail packaging for the Intel Pentium G3220 certainly isn’t what I would call exciting, but it serves it’s purpose of protecting the processor and giving us some information about the three year warranty. 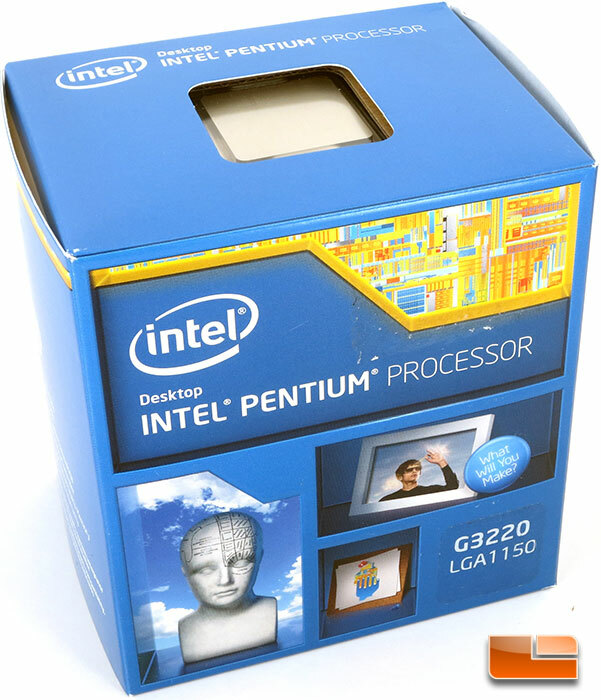 This particular side of the Pentium G3220 packaging gives us a shot of the processor itself. Aside from that there isn’t much interesting to see here. 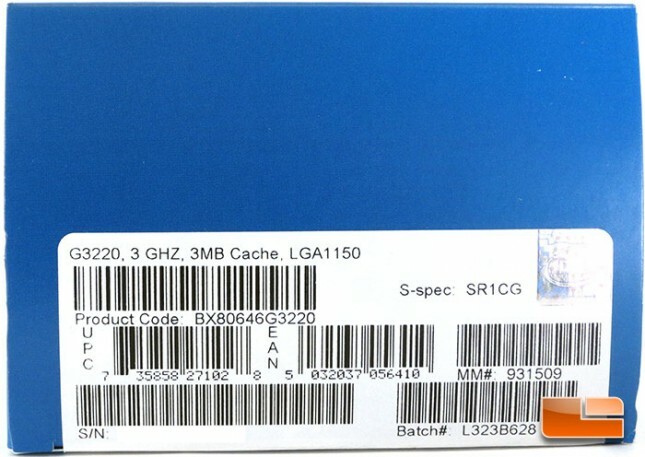 Along another edge of the G3220 packaging we can find the batch number, L323B628, Product Code BX80646G3220 as well as the various other SKU numbers. 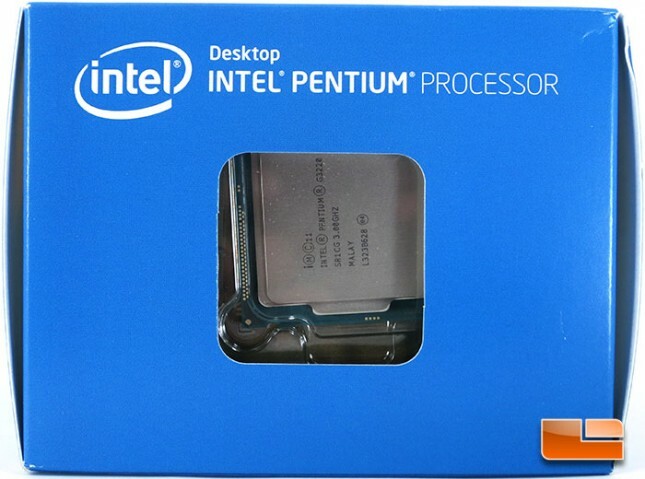 Opening up the retail package, the actual Intel Pentium G3220 is packed within a secondary plastic case. This added layer of protection helps keep the chip in place within the retail box and is great for handling and storing the G3220. Let’s take a look at the test system and get to benchmarking!